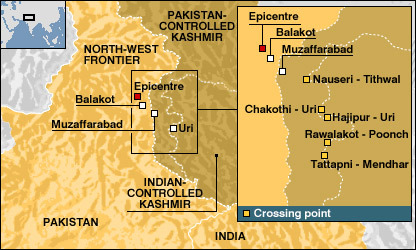 On Friday 4 November, four weeks after the devastating South Asian earthquake, BBC News hosted a live link-up with people in the city of Muzaffarabad, which was virtually demolished by the disaster. More than 100,000 homes were destroyed in the city, and residents fear that proper shelter and medical supplies will not arrive before the harsh winter sets in. As part of the link-up children from schools in the British city of Bradford put their questions to people in Muzaffarabad. Read on to find out more about the plight of some of those in Muzaffarabad, and about the Bradford children who took part in the link-up. Awaiz Asmat had expected to receive a new pair of shoes for Eid this year, replacing his tattered old trainers. Barely days before the big festival, his mother watched as those old trainers were drawn from the rubble of the school, along with the crushed body of her 12-year-old son. A final burial was arranged four weeks after he died for a boy who had impressed his teachers with his memory of the Koran and infuriated his mother with demands for sweet cola drinks and a precocious taste for chewing tobacco. "At least now I have a grave I can pray at," says his mother, Musarrad, tears streaming down her face. 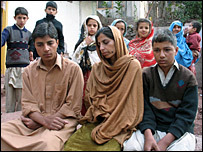 The family says it lost nine members - mostly children - to the earthquake that levelled this city four weeks ago, at the onset of the Muslim holy month of Ramadan. As Ramadan approaches its climax with the festival of Eid, there is little festive cheer in this household. Musarrad says she has nothing to live for - her husband died a decade ago and the sewing school she worked in to support her family was destroyed in the quake. She rests her head on the younger of her two surviving sons, Ahsaan. 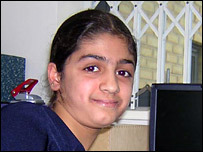 Thirteen-year-old Ahsaan is silent and withdrawn, half the hairs on his head turned white by shock. He too was meant to have been at school on the day of the earthquake - but arriving late, he instead ended up playing in the yard and was spared the fate of his brother. "Only 14 out of 40 children escaped that classroom alive," he murmurs, staring at the floor. According to the United Nations' children's fund, Unicef, children account for almost one-third of deaths in the earthquake. Unicef teams in Muzaffarabad have been working with some of the quake's most vulnerable victims - the children, many themselves injured, who survived to see their friends buried. Near a school set up in a tent, we are introduced to Shabnam, a 12-year-old with a hand permanently clasped against a wounded left eye. "I went upstairs to fetch a pen for my teacher when the school's floor began to shake like a swing," she says. Her mother found her covered in blood and keeps hugging her, grateful she survived. "She used to pester us to buy her new clothes every Eid," says her mother. "But this year she has asked for nothing." A crowd gathers around the tent school and more tales of loss emerge. But among the sobbing adults, there are also some smiling faces - the first I have seen all day. These are children too young to grieve, devising new games in the dust of the refugee camps. The young who were at the front line of Kashmir's earthquake are raising the first laughs from its rubble. For many people in the UK, the South Asian earthquake is a distant event whose magnitude is hard to comprehend. But for some, including many British children, it is a very real disaster. 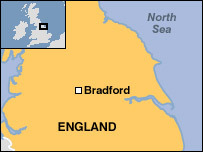 The Yorkshire city of Bradford has very close ties with Pakistan - about 70,000 of its 460,000 or so population are Muslims of Pakistani descent. 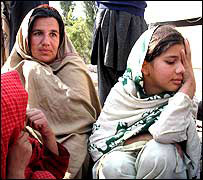 Many of them have families in the quake area and have lost close family members. Almost every single Muslim in the city knows someone who was affected. The pupils at the inner-city Byron and Thornbury primary schools are no exceptions. 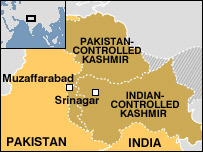 About 90% of them are Muslim, many hailing from the Mirpur area of Kashmir - close to the disaster zone. 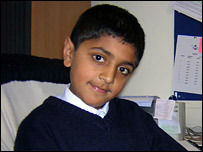 "The earthquake has affected me," says 10-year-old Hamzah Hassa, a pupil at Thornbury. "It's made me very sad. Two of my family friends died." The children display a striking empathy with children in the earthquake zone. And many are acutely aware of their different circumstances, highlighted by the fact that it is currently Eid, the Muslim festival which breaks Ramadan, the month of fasting. The Bradford children are excited about Eid, listing "visits to cousins", "money and presents" and "trainers" as things they are particularly looking forward to. Yet their peers in Pakistan are "walking to a school in a tent, without any shoes". All say they feel "very sad" at their plight - and very fortunate to be living in Bradford. "I'm trying to take more care of things at school," says Byron's Sadia Ahmed, 10. "They treat a pencil like a laptop. We have all these things - laptops, whiteboards, overhead projectors, but to them a pencil is as precious as a laptop. It makes you realise what you've got and stop taking anything for granted." All this has led to a huge desire to help. The children at Thornbury have held a slew of fundraising activities, including an auction in which the prizes included clothes, toys, and a limousine ride. Fundraising ideas at Byron include a one-hour sponsored silence. "Last time we did it for 15 minutes," explains 10-year-old Bilal Ahmed. "It doesn't sound a lot when you talk about it, but it feels a lot when you're doing it." The children are as yet showing no signs of the donor fatigue of which the Western world has sometimes been accused. The two schools - possibly with the wider local cluster of schools known as BD3 4ALL - are actively considering forging long-term ties with a school in Pakistan. This would not only help children in Pakistan, but would have much wider benefits for the Bradford children, the schools' head teachers believe. Thornbury's Angus King says: "The children can learn more about life there and develop an understanding of their own selves".